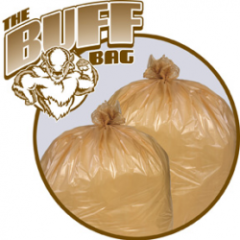 These buff, flat-packed liners are tear-resistant and made of top quality resins. P3310B - 12-16 gal. liner, 0.35 mil, 24" x 32", 500 liners per case, max load - 15 lbs. The white, coreless rolls offer a clean, sanitary appearance in a strong, heavy-duty liner. Materials used are USDA and FDA approved for food storage. MT331XW - 12-16 gal. liner, 0.45 mil, 24" x 32", 500 liners per case, max load - 30 lbs. MT403XW - 33 gal. liner, 0.95 mil, 33" x 39", 150 liners per case, max load - 65 lbs. MT483XW - 40-45 gal. liner, 0.95 mil, 40" x 46", 100 liners per case, max load - 65 lbs. MT493XW - 56 gal. 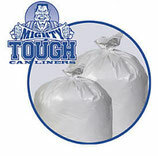 liner, 0.95 mil,, 42.5" x 48", 100 liners per case, max load - 65 lbs. MT603XW - 60 gal. liner, 0.95 mil, 38" x 58", 100 liners per case,max load - 65 lbs. Black, coreless rolls offer strength at a reasonable price. Utilizes recycled virgin resin and high quality post-consumer resin. 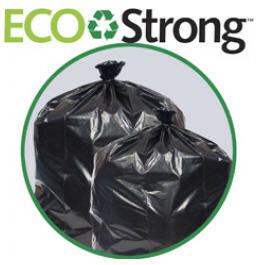 Manufactured with up to 70% recycled content. EC385815K - 60 gal. liner, 0.45 mil, 24" x 32", 100 liners per case, max load - 80 lbs. EC434715K - 56 gal. liner, 0.95 mil, 43" x 47", 100 liners per case, max load - 80 lbs.